In a previous article we discussed the pre-cleaning inspection of specialty rugs. 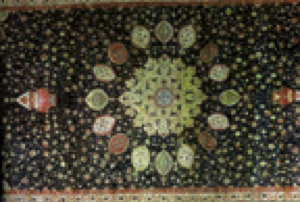 This time we will look at potential problems with hand-knotted rugs. Our industry standard is to avoid cleaning area rugs on-location. Hopefully all rug specialists are aware of this – but it bears repeating. We can, however, do our initial pre-cleaning inspection in the home. Be certain to inspect the rug front and back. If additional problems come to light back in the shop be certain to call the customer and inform them of what was found and document that information. Another country – India, China, Pakistan, Turkey, Afghanistan, etc. Identifying and classifying Oriental rugs is crucial. For instance, if the rug is a tribal piece with a wool foundation, you will not do a corrective bleaching of the fringes. To do so would cause irreparable damage. This knowledge can only be gained through a mentor, reading of books, or attending advanced training courses. Knowledge brings confidence and protects you from expensive errors. I recommend any or all of the avenues of expertise available. Though there are dozens of concerns to be aware of, let us focus on the some of the most common to look for during the pre-cleaning inspection. A key problem is rotten fringes. Dry rot can be the cause, or a chemical wash residue. 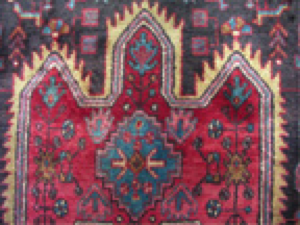 Today most Oriental rugs have been chemically washed in their country of origin. A diluted solution of chlorine bleach is used to give the rug luster and to tone down the colors. When the rug is hung to dry, any slight chlorine residue can concentrate in the bottom fringe and cause the cotton to become brittle. Always give a tug on a few strands of the fringe, not a handful. If it is rotten, that is what you will end up holding. 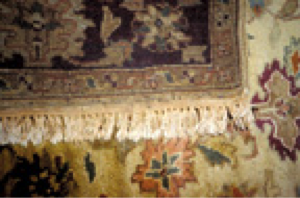 Painted warps and wefts on worn, old, valuable rugs is another typical problem. Generally, this is done to defraud the retail customer. 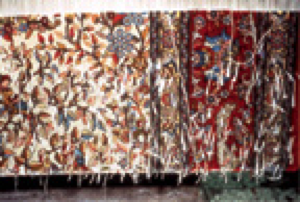 Once the rug pile is worn down to the foundation (Image 4), unwary consumers will purchase rugs that have dye applied to hide the pile loss. Acid pH dyes are used to match the color on the wool face yarns. However, when applied to the cotton foundation it is not colorfast (Image 5). Therefore when doing your pre-cleaning inspection, look for portions of the design that do not have a harmonious color palette. Doing the inspection on your hands and knees is essential, not only to notice pile that is worn down to the foundation but also to assess other problems. Urine is a constant problem with area rugs of all types. In fact, I have never met a rug that did not have urine on it. Your customer may not have pets, but the previous rug owner may well have. Urine left on the rug for any amount of time will damage the dyes. If the construction of the rug will allow it, soak the rug to remove the urine. This is best done in rug washing pit (Image 6). This type of urine restoration should always be done with the customer’s approval (and signed release). Urine may have broken the dye-fiber bond and the rug will bleed. 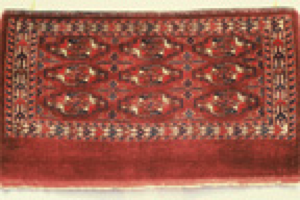 A rug which can be surface cleaned safely may bleed when immersed. Use caution! White knots (Image 7) can be found in most hand-knotted rugs. 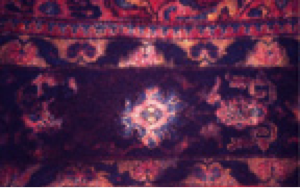 They are a result of the warp yarns breaking when the rug is woven (Image 8). Very often, if it is a used rug, the dealer has taken marker pens to blend the white knots into the rug pile face. This material will clean off the surface and you will be left with the job of finding marker pens to get the rug back to its original appearance. The last problem we will discuss is a recent trend in rug finishing: the tea wash. This is sometimes called antique wash. 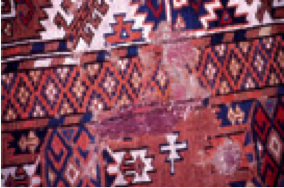 It is a dye that is sprayed on a rug after it is woven. Originally, tea or henna (a natural dye) was used to give a yellow hue to the rug. 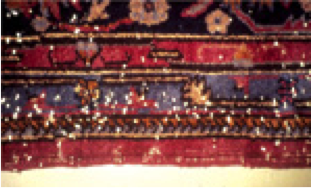 This dye often will be removed from the rug with washing or spotting. The fringes are a particular problem, as they will often have a mottled look (Image 9). Qualify this type of rug with your customer and charge to re-apply the dye to the fringe. If not qualified with the homeowner you will end up re-dying the fringes for free. Tea bags can be used to re-dye the fringes. Also, use caution with acid pH cleaning or spotting products as they particularly remove this type of dye.